Five attackers and three members of the security forces been killed in an attack on an Indian air force base near the Pakistani border, officials say. Security personnel secured Pathankot base on Saturday evening, after a battle lasting more than 14 hours. The heavily-armed gunmen entered the base dressed in Indian army uniforms. The attack came days after the Indian and Pakistani leaders, Narendra Modi and Nawaz Sharif, met in Lahore to launch a surprise peace initiative. No group has said it carried out the attack, which is being seen as an attempt to undermine those efforts. All of India's Punjab state has been placed on alert. Soldiers are combing the area around the base looking for more militants. "We want peace but if terrorists carry out attacks on Indian soil we will give them a befitting reply," said Indian Home Minister Rajnath Singh. Pakistan condemned the attack and called it a "terrorist incident", adding that it remained committed to peace efforts with India. The gunmen drove a hijacked police vehicle when they launched the attack at 03:30 (22:00 GMT Friday). They entered living quarters at the base, but were contained there and so were unable to cause any damage to military hardware, said air force spokeswoman Rochelle D'Silva. Later on Saturday morning, fresh gunfire was heard and a helicopter seen firing at an area inside the base. But by the end of the afternoon, police confirmed the base was secure. The BBC's Sanjoy Majumder in Delhi says it is not yet clear who the attackers were - but suspicion is already falling on Kashmiri militant groups based in Pakistan. Some Indian security officials suggested the Islamist militant group Jaish-e-Mohammed was to blame. India says the group is backed by Pakistan, but Islamabad denies this. In July seven people were killed in a similar attack when gunmen stormed a police station in nearby Gurdaspur district. The three attackers in Gurdaspur were killed after a 12-hour standoff with police. 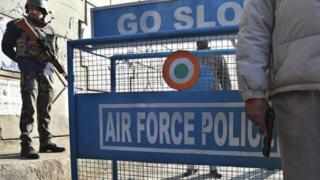 Pathankot air force base is about 430km (270 miles) north of the Indian capital, Delhi and is on the road linking Indian-administered Kashmir with the rest of the country. Indian-administered Kashmir has seen a long-running insurgency against rule from Delhi, and Kashmir has been a flashpoint in relations between Pakistan and India for nearly 70 years since independence. Can Pakistan and India ever live in harmony?